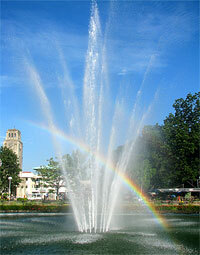 I think we can consider Gaston Park to be the center of the City of Cagayan de Oro. It functions as the equivalent of the town plaza since to the northwest stands the City Hall and to the southwest is the Saint Augustine Metropolitan Cathedral, which is the seat of the Archdiocese of Cagayan de Oro. To the west lies Cagayan de Oro River and the Carmen Bridge. Gaston Park was named after Segundo Gaston, a pre-war mayor of Cagayan de Misamis (the old name of the city) who served from 1916-1919 and then went on to become the governor of the old Province of Misamis. The park was the site of a Spanish settlement established in the 1620s by the Augustinian Recollects. A wooden (then stone) fort, called Fuerza Real de San Jose, was built at the site to repel the Moros under Sultan Kudarat coming from the south but was later demolished in 1875. The area became an execution area for criminals during the Spanish period and later as a training ground for Filipinos during the Philippine-American War. As you can clearly see from the Google Maps thumbnail, Gaston Park is a circular park about a 100 meters in diameter and the big round smaller circle at the middle is a fountain pictured to the side. The fountain was created through the initiative of former Mayor Justiniano Borja. The place is a popular hangout during Sundays (probably by the churchgoers from the nearby cathedral). Thanks for the background information on Gaston Park. I really enjoyed my visit there this summer. This is a good reminder for me to submit that photo on Panoramio for inclusion in Google Earth. @Marc, well, thanks for sharing the photo. And good idea on submitting the photo on Panoramio. Also, have you geo-tagged your photos in Flickr?